Very cold and well-balanced colour gamma includes blue-gray, lavender, charcoal, purple, blackberry. Despite of the fact that purple and blackberry are pretty bright colours they do not stand out, but they bring solidity and depth instead. These colours can be used to design interior of a bedroom, bathroom and a lounge area in a restaurant or club. 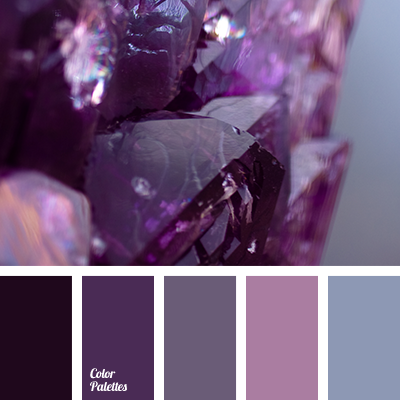 amethyst, blackberry, blue-gray, charcoal, colour of amethyst, colour of violet orchids, colour palette for a winter wedding, colours for the decoration of a wedding, dark lilac, dark purple, dark purple colour, lavender, lilac, monochrome pink colour palette, monochrome violet colour palette, purple, shades of lilac, shades of violet.